I’d been wanting to learn more about the writing side of picture books, so I jumped at the chance to attend my first SCBWI Masterclass, Writing for Illustrators with Maisie Paradise Shearring at the House of Illustration. 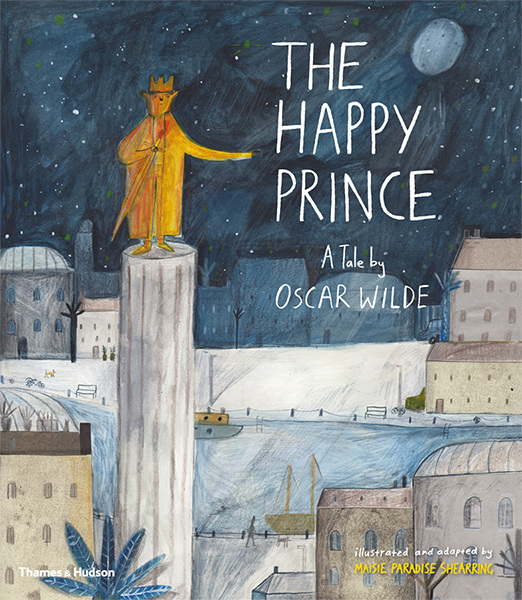 Maisie studied an illustration BA at Edinburgh College of Art before attending Cambridge School of Art for the MA in Children’s Book Illustration. She went on to win the prestigious Fundación SM International Award for Illustration at the Bologna Children’s Book Fair 2015 for her graphic novel, Susan’s Schooldays. Maisie’s presentation style was relaxed, funny and informative as she talked us through two of her books, The Happy Prince, her picture book adaptation of Oscar Wilde’s fairy tale, and her latest picture book, Anna and Otis, due out in August 2018. 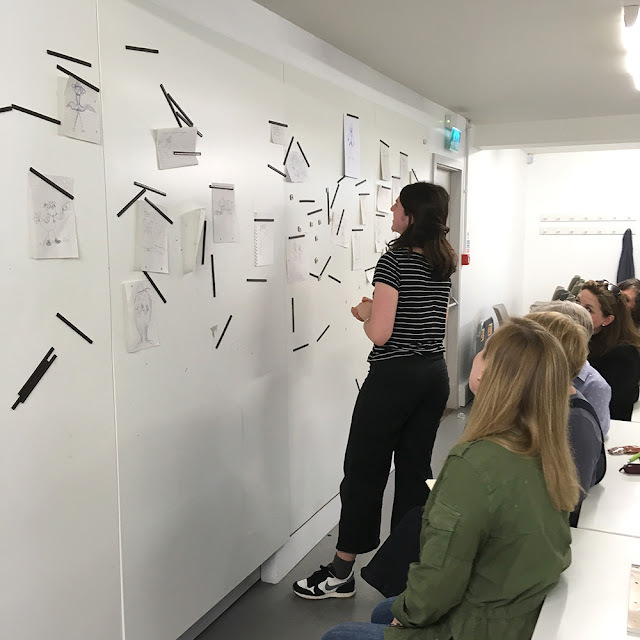 Maisie explained that for her, the procrastination is an essential part of the process, and that it does lead naturally to the next phase, which is all about getting to know her characters. For Maisie, this usually means lots of fast-paced drawings in a sketchbook, drawing characters over and over in different situations. 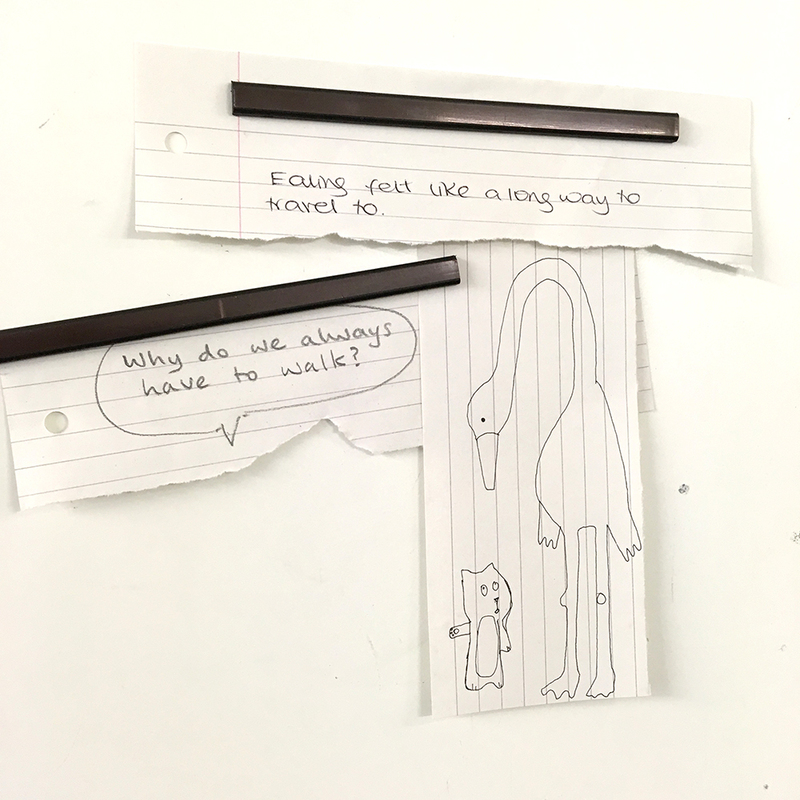 She ‘takes her characters for a walk’ and imagines which shops they might go into and draws them in that scene, all the time thinking about what their feelings might be. Maisie pushes the sketchbook work further by playing with materials and she encouraged us all to have fun and experiment in sketchbooks, explaining that a whole story might come from just one of these sketches. When in illustrator mode, I find it can be easy to get carried away with the artwork and leave the story writing as an afterthought. So Maisie’s strategy of dealing with this by linking images to words and pairing sketchbook drawings with sentences was a great idea and I will definitely try this for my next picture book. 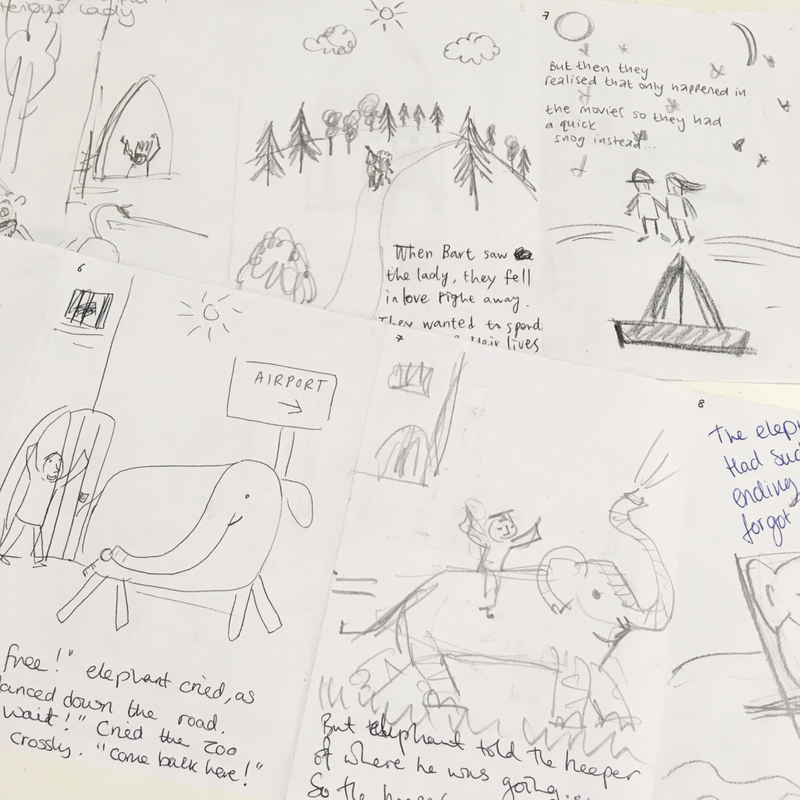 To illustrate the process, Maisie had prepared a group exercise for us called 'Random Sentences', where we had a go at linking illustrations with text. The results were surreal and very funny! It helped me understand how text can be entirely random to an image and still work well. The sentences added a completely new dimension to the images. 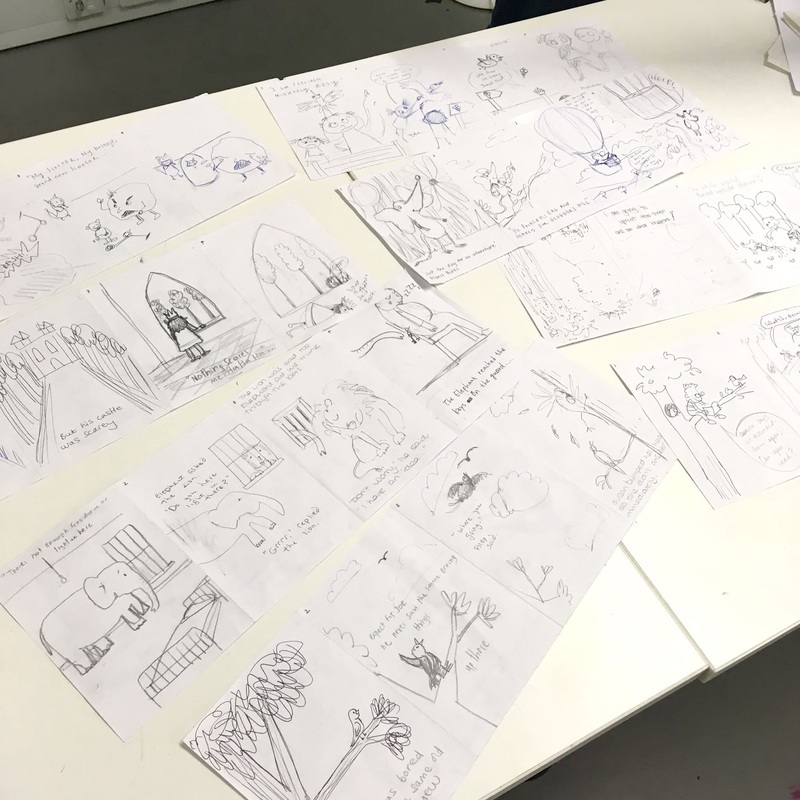 Following on from this, Maisie talked about how it can be hard to get into a story and advised illustrating stories written by others as a way to learn about pacing and rhythm. She suggested we think back to books that inspired us as children as a way of finding our voice. Other sources of inspiration that Maisie uses to spark story ideas are people-watching, overheard conversations, understanding people’s feelings and memories of family and friends from childhood. She suggested that these can all help you work out where your story comes from and how it links to you. 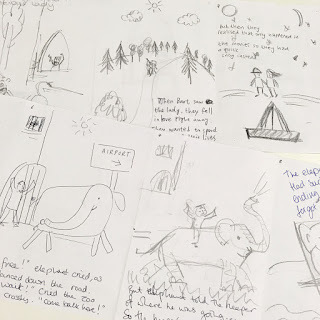 Maisie recommended getting these thoughts down in a storyboard, with no text initially, to help you focus on getting the images to tell the story. Text can be added later. (Handy Tip No. 1: use post-it notes for your text so that you can change it around easily). Maisie went on to explain how to use your storyboard to help work out the pacing and how reading your story out loud can highlight any areas where the story stumbles. (Handy Tip No. 2: ask someone else to read your story out loud as well, as they will read it differently and stumble in different places to you.) After the storyboard, Maisie suggested we get the story into a rough dummy to see how the page turns work for the moments of drama. What is it that you are trying to communicate to the reader? What is the point of your story? 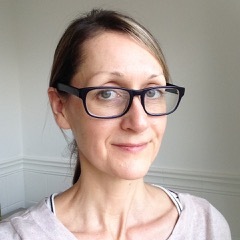 To help find the answers, Maisie advised writing lots, more than you need, as it will help you work out the point of your story - the text can always be pared down later. We spent a happy afternoon working through two more exercises where we had the chance to put Maisie’s words of wisdom into practice. 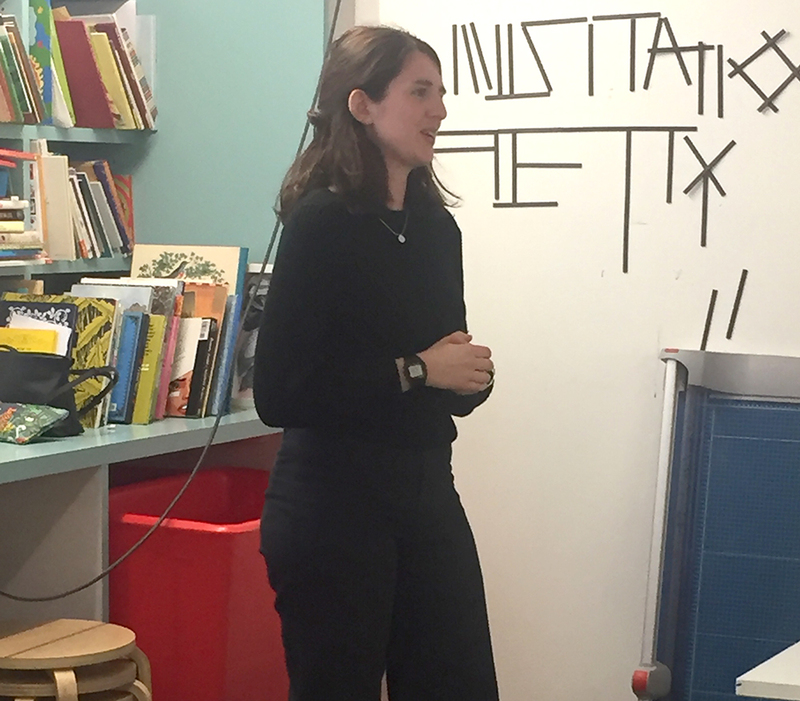 Maisie is a talented illustrator and it was inspiring to hear about her working process that she so generously shared with us. Thank you Maisie and the SCBWI Illustration team for a really enjoyable and enlightening afternoon!